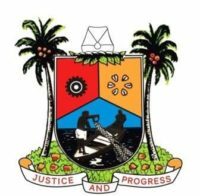 Lagos State Government has tasked its workforce to come up with suggestions on how to formulate and execute government policies that would address challenges confronting majority of the populace. 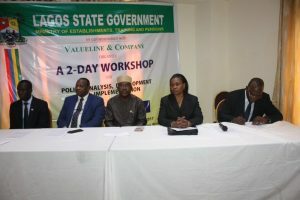 The State Commissioner for Establishments, Training and Pensions, Dr. Akintola Benson-Oke gave the charge today at the opening session of a workshop tagged: “Policy Analysis Development and Implementation”, organised by the State Government for Policy Analysts in Lagos Public Service at Ikeja. He maintained that those involved in government policy process need to possess strong analytical skills and ability to apply a variety of research and evaluation methods within a complex political and economic environment. The Commissioner said that the training will review the analytical approaches that are essential for effective policy development in modern times. “The training will cover the nature and role of policy analysts and the interaction among social institutions, markets and government. It will examine how to conduct effective policy analysis, manage the policy development process, and produce sound and persuasive policy reports and recommendation to the government,” he said. He informed that policy-making and implementation functions in governance are important because governments are repeatedly confronted with problems that call for apt and appropriate solutions. Benson-Oke added that challenges of governance in recent time have taken complex features and as such a government of metropolitan state like Lagos must have a pool of skilled, trained and current policy analysts and developers who will assist the government in designing the right, appropriate and sustainable answers to complex and urgent problems. The Commissioner said that the present administration is taking up challenges to aspire to the highest standards of governance and administration that the citizens expect of the government. He maintained that all the achievements of the Ambode-led administration since inception is hinged on the quality of reforms and policies enunciated by the government policy makers, adding that there is little or nothing that could be achieved by any government without a robust policy-making process. He, therefore, urged participants to embrace the capacity development initiative and open their minds to new ideas that might emanate in the course of the training. “I exhort public policy analysts and developers in the Lagos State Public Service to learn to focus quickly on the central decision criterion of a problem requiring attention, avoid the Tool-box Approach to analysing policies and also learn how to deal with uncertainty”, Benson-Oke reiterated.